MenuCalendarClock is an iCal compatible menu calendar and a configurable menu clock. Besides an elegant and streamlined look, it offers many compelling features to make it the ultimate calendaring utility for the Mac. Get a registration (for $19.95 only) to access advanced features or use the basic features for free. Version 2.7.5 (for 10.4) is a free update for all registered users. Version 3 is for Mac OS X 10.5 (Leopard) or higher only. Version 3 features require a new upgrade key. 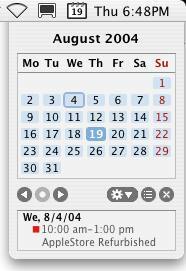 MenuCalendarClock is compatible with Mac OS X 10.7 (Lion)! Tip: 'About this Mac...' from the Apple-Menu shows your Mac OS X version. For registered users, Objectpark Software provides email support for Menu Calendar. Please direct your questions to menucalendarclock@objectpark.net if you do not find an anwer to your question in the online help. Feel free to send general feedback and suggestions as well! Localization: You can translate MenuCalendarClock into your language (if not yet supported) by editing one short, simple text file! Please email us for the file template!